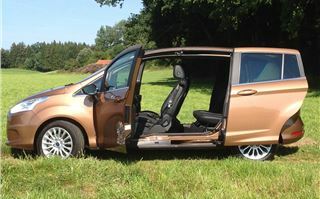 The new Ford B-Max solves a problem that hasn’t been properly tackled for years: doors on a car are a bit of a nuisance. Put big doors on the front and, while that may make the car easy to enter and leave in wide-open spaces, you might not be able to get out at all in a narrow garage. Adopt big sliding front doors and the car will fail disastrously, as the Peugeot 1007 proved. But there was a lesson to be learned from the 1937 Lancia Aprilia, the 1983 Nissan Prairie, a plethora of pick-ups with rear-hinged rear doors, the Honda Element and the Mazda RX8 that had them as well. Get rid of the central door pillar and life becomes easy for everyone. 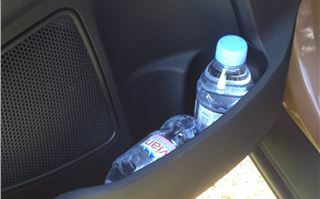 Mums and dads can strap their toddlers into the back seats without breaking their backs. The elderly and the arthritic can simply walk into the car with the minimum of bending. And the disabled can stash a wheelchair behind themselves without having to summon help. The problem with all this, of course, is that the central ‘B’ pillars are the strength of the car. 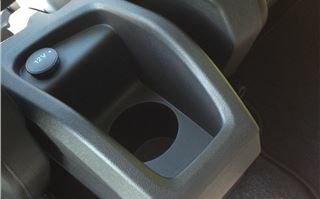 They prevent its bodyshell from twisting and they provide protection from side impacts. 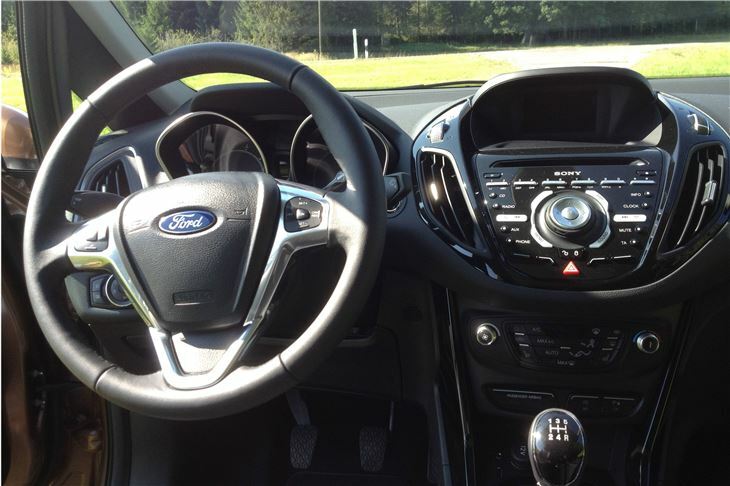 So how did Ford manage the open-sided approach without compromising the car? They adopted something called ‘crash catchers’. 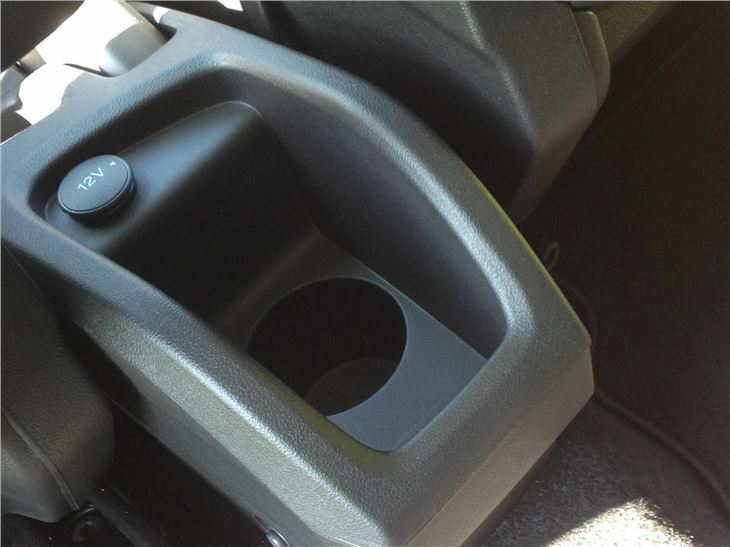 The front doors of the B-Max contain the B-pillars that lock into place in the doorframe. And the rear doors interlock into the front doors to give a structural stiffness the equal of a car with a B-pillar. 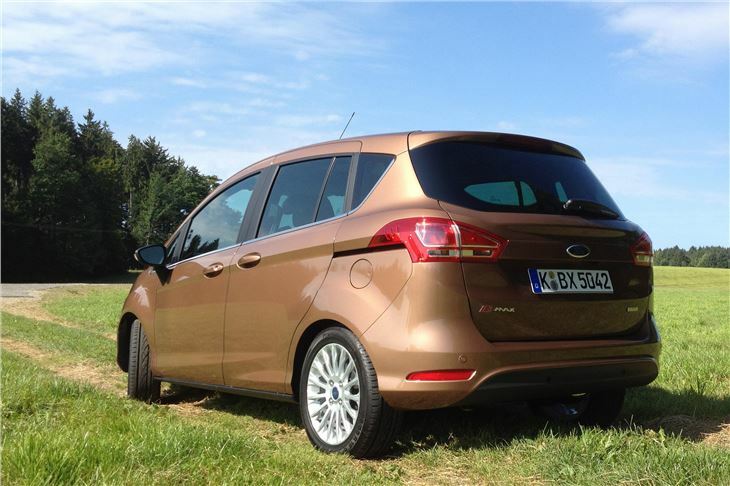 Ford is so confident from the extensive testing in its development programme it expects the B-Max to achieve a high 5 star score in the NCAP tests, the results of which will be announced in November. But, being a Ford, and up against some strong competitors among other MPVs, the B-Max doesn’t just have to join them, it has to beat them. 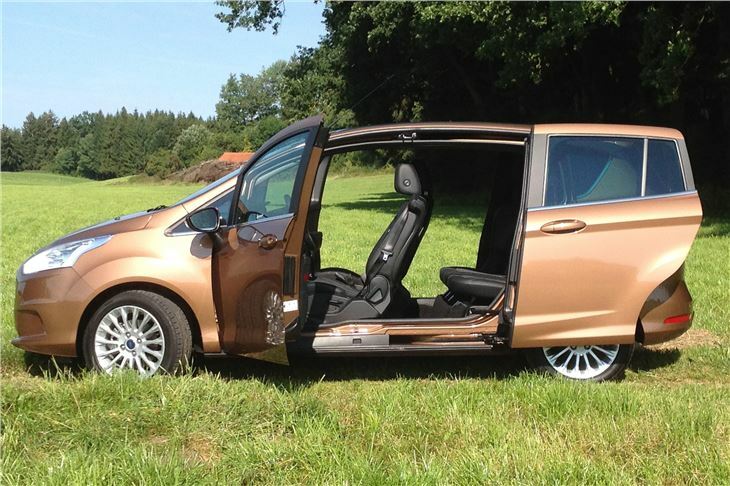 As well as class leading ease of entry and front and rear head and legroom, it has a lipless and level rear load deck with quick folding seatbacks. 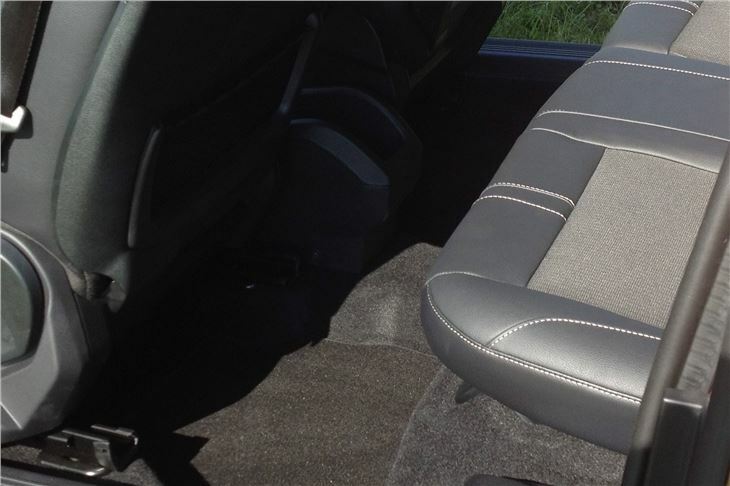 The passenger seatback can be folded flat forwards so the car can accommodate loads up to seven feet long. There are huge door pockets. 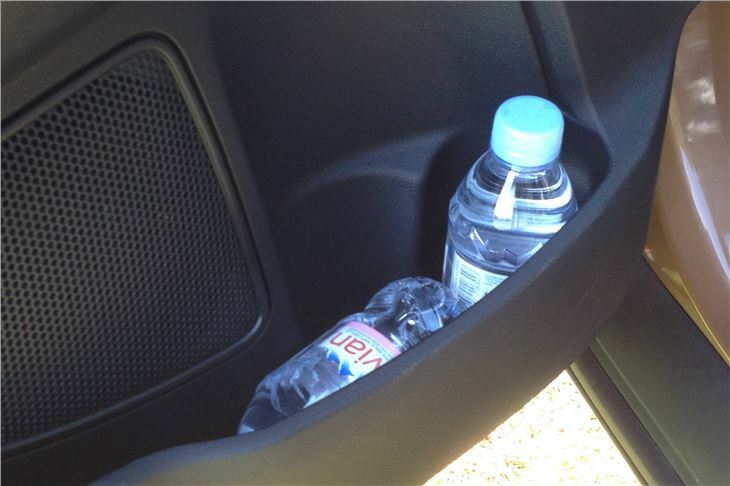 Cupholders and power sockets wherever five inside are likely to need them. Map nets. Child proof locks for the rear sliding doors. A mirror to check what the kids in the back are getting up to. 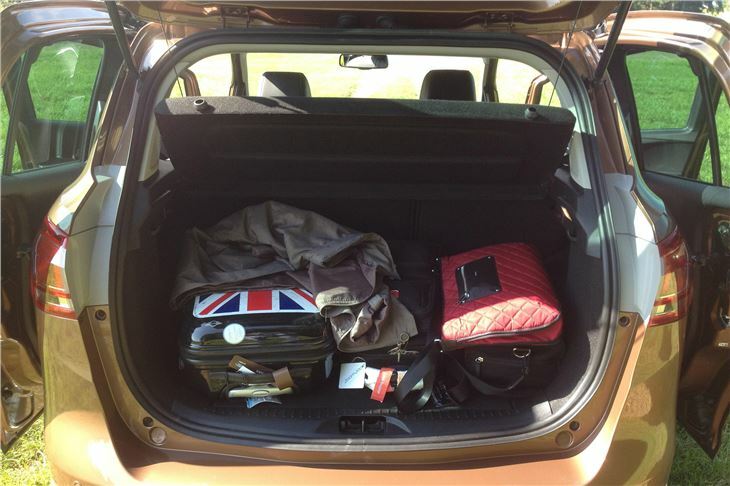 All the knick-knacks you need for a proper family car. 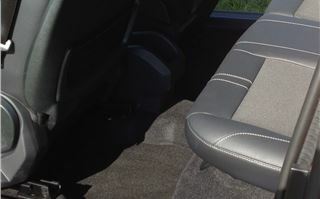 And a premium feel to the whole car, with good quality plastics, nice fabrics and the extra cost option of part leather seats. It drives very nicely too. 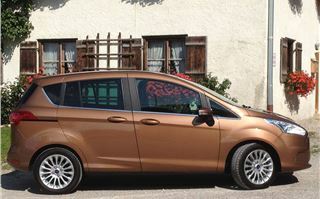 The ride on 195/55 R16 tyres is fine, even on some surprisingly rough surfaces for Bavaria where we were testing it. The steering is well weighted. 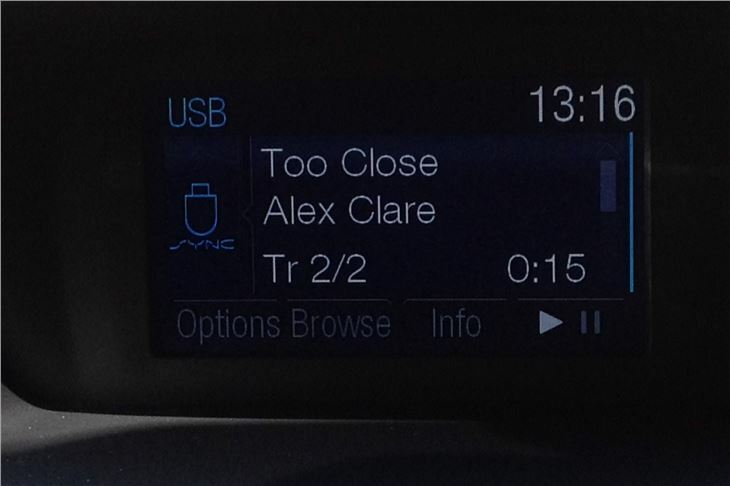 The relationship of the controls is properly integrated (unlike those of the Peugeot 208). The seatbacks will squeeze some people’s shoulders (mine), but the seats are otherwise very comfortable and adjustable in all directions. 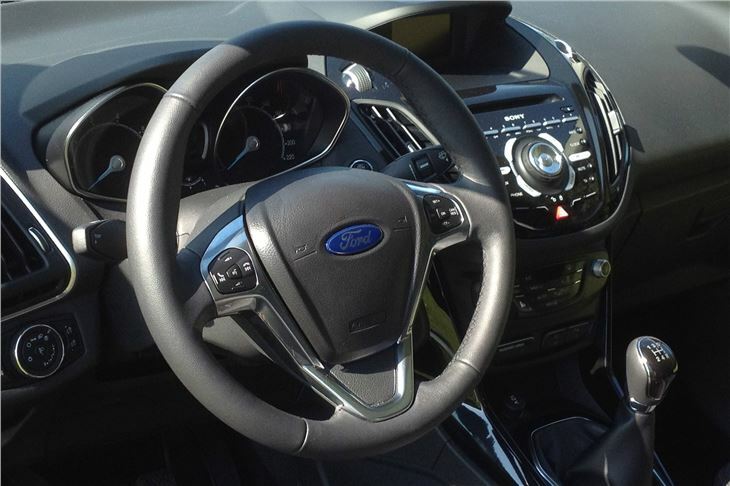 You’re offered a choice of engines: 1.4 petrol, more powerful and more economical 1.0 litre EcoBoost petrol engines, a 1.6 petrol with Ford/Getrag’s Powershift twin clutch automatic transmission, and a couple of diesels. The more powerful of the two diesels comes in at 109g/km CO2 and should do 55-60mpg, had a not unpleasant gruff tone of voice, but lacked ‘pulling power’. Geared at 30mph/1,000rpm in 5th we had to change down far more than we would like to with a diesel, often into 2nd for what would normally be a 3rd gear corner. In contrast, the 120PS 1.0 EcoBoost was a really lively little thing with plenty of pulling power to haul it up the hills. Lower geared than the diesels at 25mph/1,000rpm in 5th, it was happy to take turns in 3rd for which 2nd had been needed for the diesel. 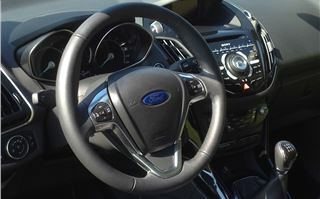 The slight downside is a CO2 output that dumps it into the Band C VED bracket of £30 a year and, whatever Ford claims, 50mpg is going to be difficult to crack. I wouldn’t expect better than low 40s. 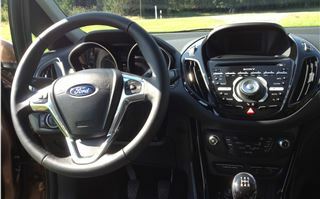 Most models at launch come with Ford Microsoft ‘Sync’, that’s a slightly more advanced version of ‘Blue & Me’ in a FIAT. 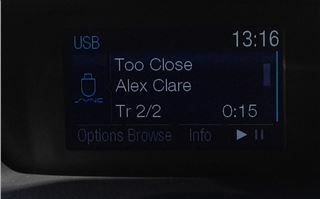 It integrates phones, iPods and USB sticks with the car’s DAB radio system very easily, the whole system can be controlled by voice command and, if you should ever crash, it alerts the emergency services to your exact location. 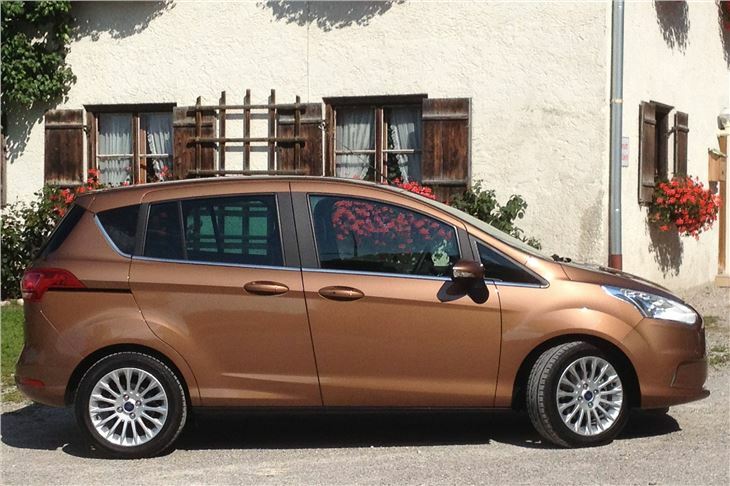 Ford reckons 36.5% of B-Max will be 1.0 EcoBoosts, 38.5% will be 1.4 manual and 1.6 petrol automatic, and 25% will be diesel. 65% will go to private buyers and 35% to fleets, but most fleet sales will be to Motablity so the low fleet presence should ensure an average 37 residual value after 3 years and 30,000 miles. 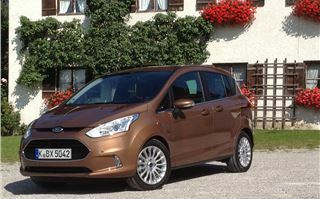 The Ford B-Max succeeds in ‘opening up’ a chunk of market where it could have failed. I can imagine a few conquest sales from current owners of Nissan Notes and Honda Jazz. 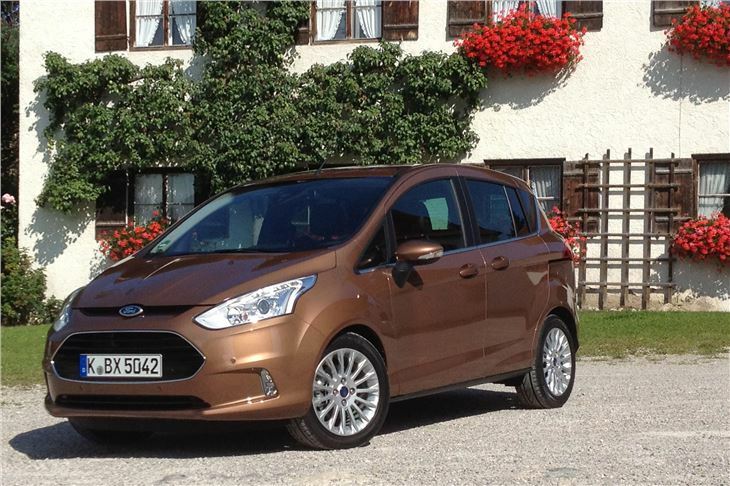 And anyone already contemplating a Citroen C3 Picasso, a Hyundai ix20, a KIA Venga, a Toyota Verso S or a Vauxhall Meriva should get down to their Ford dealers and take a look.